SUCCESS BEGINS WITH ATTITUDE. Yet a truly positive, resilient outlookthe kind that just won't quitoften takes training, self-reflection, and practice. But staying positive in tough times isn't easy. If you've experienced a setback at work, suffered a personal loss, or struggle to make it through the monotony of the workday, A Kick in the Attitude is for you. What jumper cables are to a car battery, this book is to your attitude. It's the positive charge you need to break out of the trap of negative thinking and get back on the track to achieving the success you deserve. What if you already feel happy and successful? You will still benefit. A Kick in the Attitude is that positive charge that will catapult your life in a positive direction. It will recharge your batteries and keep you thriving through all life's ups and downs. It shows you how to develop the kind of positive, resilient outlook on life that keeps you goingwith just a little training, self-reflection, and practice. 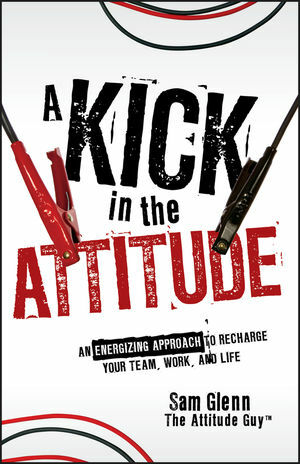 A Kick in the Attitude describes the concrete, proven principles that will put focus and vigor back into your life and work. It gives you the tools you need to revive your attitude with passion and purposeto make your attitude work for you rather than against you. This is a simple, straightforward guide that will let you convert adversity into new directions and new opportunities; improve your productivity and teamwork in the office; and bring passion and confidence to everything you do in life. Featuring eighteen principles for living and working with enthusiasm and positivitythis is just the kick-in-the-pants we all need. SAM GLENN is known as The Attitude Guy™ and founder of Attitude Digest magazine. He delivers more than 100 invigorating and inspirational speeches a year to organizations that believe the right "Attitude" is a vital ingredient to achieving success. Once down on his own luck, Sam Glenn now offers his experience, research, and advice to get people positively charged for taking action and achieving positive results.